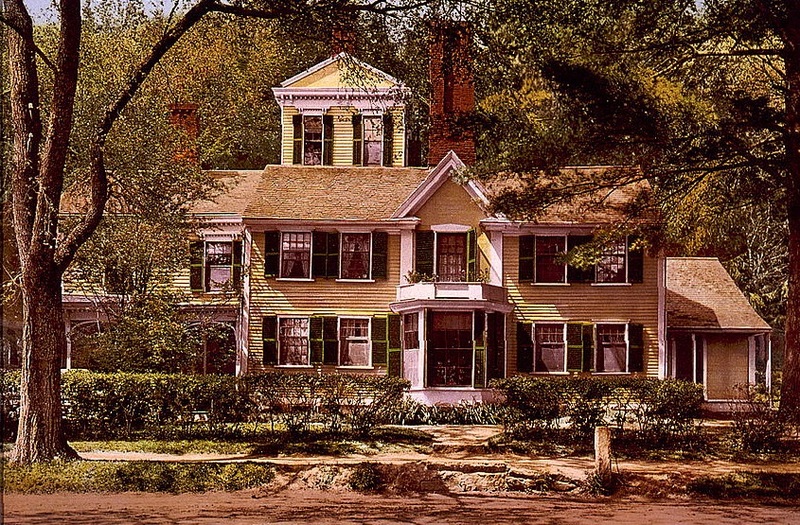 Hawthorne’s home in Concord, The Wayside, which he purchased from the Alcotts in March 1852, soon after “Feathertop” was first published. Color photomechanical print by the Detroit Photographic Company, ca. 1900. Courtesy of the Library of Congress. In 1840 Nathaniel Hawthorne sketched out an idea in his notebooks, “To make a story out of a scarecrow, giving it odd attributes. From different points of view it should appear to change—now an old man, now an old woman—a gunner, a farmer, or Old Nick.” It would take more than a decade for Hawthorne to finish the tale, which would be the last piece of short fiction he published—and the scarecrow is the only aspect of this early outline that remains in the final version. Although “Feathertop” may seem at first blush to be “one of Hawthorne’s more whimsical tales,” writes Massachusetts high school teacher David Donavel, “it is nevertheless larded with wry observations about both the act of artistic creation and the shallow values of those who occupy the top rungs of society.” Hawthorne compares Mother Rigby’s scarecrow to the “somewhat lukewarm and abortive characters [that] have so over-peopled the world of fiction” (including, the author himself confesses, his own tales). As for “shallow” social values, Hawthorne saves his choicest comments until the ending of the story—which we dare not give away to our readers. Hawthorne's highest achievement is not in The Scarlet Letter and The Marble Faun, distinguished as they are, but in the best of his tales and sketches. The last of these, the extraordinary “Feathertop,” sub-titled “A Moralized Legend,” is as uncanny a story as Kafka’s “Country Doctor” or “Hunter Gracchus,” and has about it the dark aura of Hawthorne’s valediction, his farewell to his own art. . . .
Feathertop is closer to most of us than we are to Hester Prynne. [The story’s] final dismissal of heroism is Hawthorne’s ultimate legacy, glowing on still in the romances of Nathanael West and Thomas Pynchon. The pipe was in the old dame’s mouth, when she said these words. She had thrust it there after filling it with tobacco, but without stooping to light it at the hearth; where, indeed, there was no appearance of a fire having been kindled, that morning. . . . If you don't see the full story below, click here (PDF) or click here (Google Docs) to read it—free! Truly a brilliant story from a brilliant writer. Does Feathertop symbolize us , charlatans and coxcombs? Does the author point out how we are nothing better than scarecrows worthy of scaring just crows? Does Featherton show more courage and understanding than us? We don't dare look at ourselves in the mirror of reality,probably because we are frightened to discover just straw from head to toe.